Before I talk about the value of a universal 4-20mA analog output on a level controller, let me explain why anyone would care. It’s all about ground loops. Since the early days of electronic instrumentation, way back when, even before cell phones or PCs, instrument people struggled with ground loops that create an offset error, drive the signal off scale, or burn up an analog circuit. Ground loop problems are especially rampant with so-called “four-wire” instruments, those that use two wires for power and two wires for an output signal, like a gas analyzer. A four-wire device has an ‘active’ or a ‘sourcing’ analog output (two different words for the same function). A ground loop occurs because the ground potential at the field instrument is different than the ground potential at the receiver’s analog input. Wherever there’s a potential (voltage) difference, current flows. But the current that flows in the ground loop is not part of the measurement signal. It adds to or subtracts from the measurement signal and creates an offset error, sometimes driving the signal outside the range the analog input can handle (off scale). And in extreme cases, it damages the loop’s electronics. The widespread use of inexpensive, single-ended analog input boards on PLCs keeps the ground loop issue alive and well. Three- or four-wire devices with separate power lines are more likely to create ground loop issues. The quick solution to a ground loop problem is a $300-$400 loop isolator module that prevents the effects of a ground loop by isolating one end of the circuit from the other. But that’s costly solution, especially with multiple loops (you need to buy one isolator for each loop). The design of (most) two-wire, loop-powered field instruments make them far less susceptible to ground loop problems. A two-wire loop powered transmitter has a ‘passive’ or ‘sinking’ output that requires a separate power supply to provide power over the same two wires that the current signal uses. In plants with a DCS (distributed control system), two-wire, loop-powered field instruments are preferred, in part because loop powered instruments are usually isolated, and because the use of a single DC power supply to power multiple passive field instruments minimizes the conditions that create ground loops. Siemens’ new LUT400 level transmitter/controller has a great feature: a ‘Universal Analog Output’. The analog output (level, distance, flow rate) can be either “active/sourcing” (powered by the LUT 400 in a four-wire mode) or “passive/sinking” (output loop powered by an external loop power supply). The active output can be wired up to see if it works without a ground loop. If it does, Great! But if there’s evidence of a ground loop, you just move a single wire from the active output terminal to the passive output terminal in the LUT 400, add an external DC power supply to the circuit, and the ground loop disappears. As you can see in the diagram here, the LUT400’s universal analog output uses two terminals for an active LUT400-powered current output and a different terminal for a passive loop-powered analog output. It’s easy to see the difference in active vs passive by comparing the two diagrams below. The Passive (sinking), loop powered analog output (AO) requires an external DC power supply (circled in red), whereas the external power supply is absent in the Active/sourcing diagram. You may not always have a $300-$400 loop isolator module readily avaiable, but it’s rare not to have a $70 24 VDC power supply on hand, if there isn’t already one in the panel. The choice of active or passive minimizes the chance that an LUT400’s output loop will need a loop isolator module. If your ultrasonic level controller’s signal shows an offset, noise, or is driven off-scale by ground loops, a universal output with a passive loop powered output will likely solve the issue. 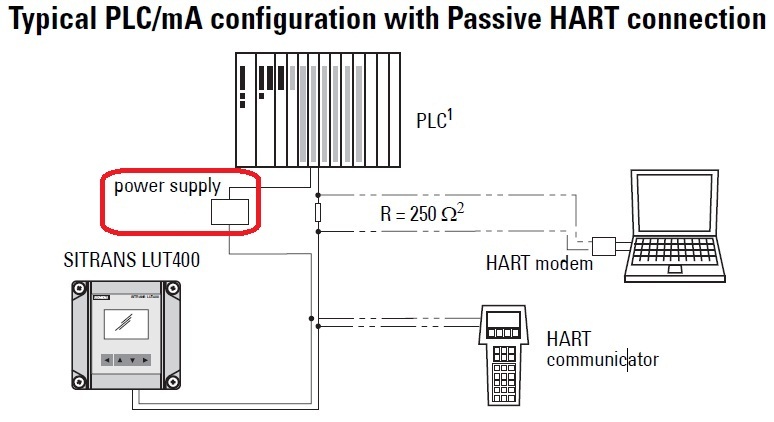 The passive/sinking mode allows for one or more LUT400s to operate on a HART multi-drop loop that uses a HART multiplexor. The latest and greatest in ultrasonic level controllers has the most versatile functionality in loop connectivity, the Siemens LUT 400. If you’re not familiar with the Siemens LUT400, read my review here. 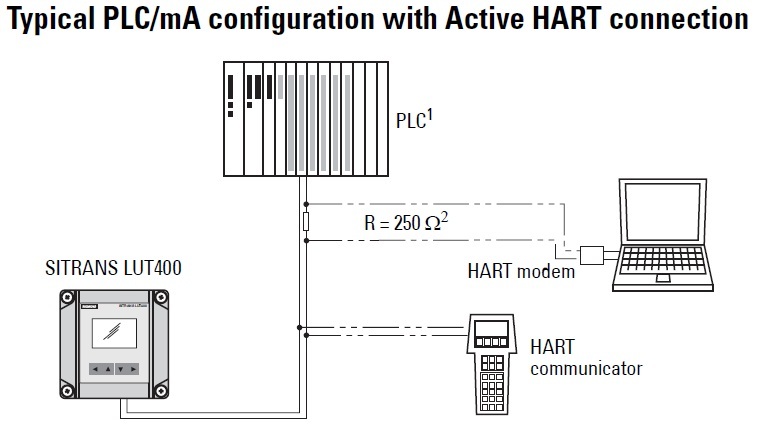 This entry was posted on August 16, 2013, 3:15 pm and is filed under 4-20mA, HART, Installation, Level, Level Transmitters, Ultrasonic. You can follow any responses to this entry through RSS 2.0. You can leave a response, or trackback from your own site.